While I don't change my regular skincare routine much, I love trying out face masks, and the overnight, no-wash/leave-in masks are among my favorites. For a long time, I had been using the Clinique Moisture Surge Overnight mask, and while I still think it's a pretty amazing mask to use, especially in the winters, I also wanted to try something lighter for the summer months. 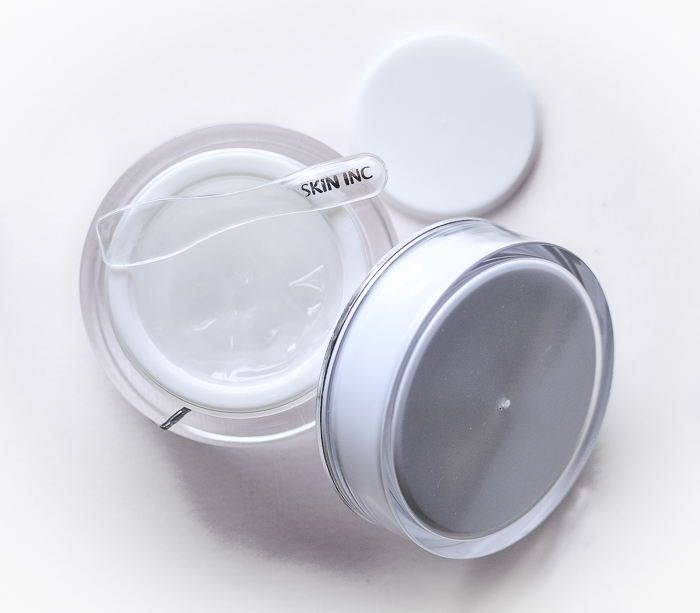 Right on cue, I received a deluxe sample of the Skin Inc Pure Deepsea Hydrating Mask with one of my Sephora orders, and I loved the clear gel mask so much, I promptly bought myself a full size jar. This hydrating moisturizing mask claims to brighten, hydrate, and clarify skin in one easy step with ingredients like Okinawa deep sea water, hyaluronic acid, and soybean extract. Scroll on for more on this leave-on mask. 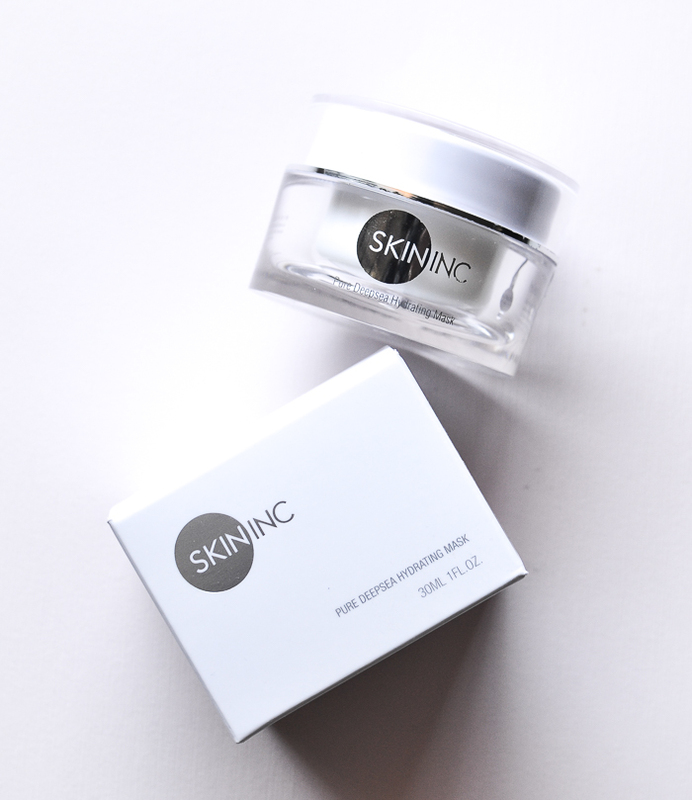 Skin Inc Pure Deepsea Hydrating Mask is a clear gel that is applied on just like any regular moisturizer, after cleansing and on dry face. Apply a thin layer all over the face including under the eyes. That part really surprised me at first because a lot of products suggest avoiding the delicate undereye area. The mask is clear as it goes on - obviously, because the gel is clear - and it dries up and disappears soon after application. There is no discernible fragrance to it either, and apart from a slight tightening (like drying) feeling on the skin, there is not much apparent on the skin. It's almost as if I applied an oil-free gel moisturizer. Wait about 30 minutes and rinse off or leave on overnight (or all day if you are staying at home). 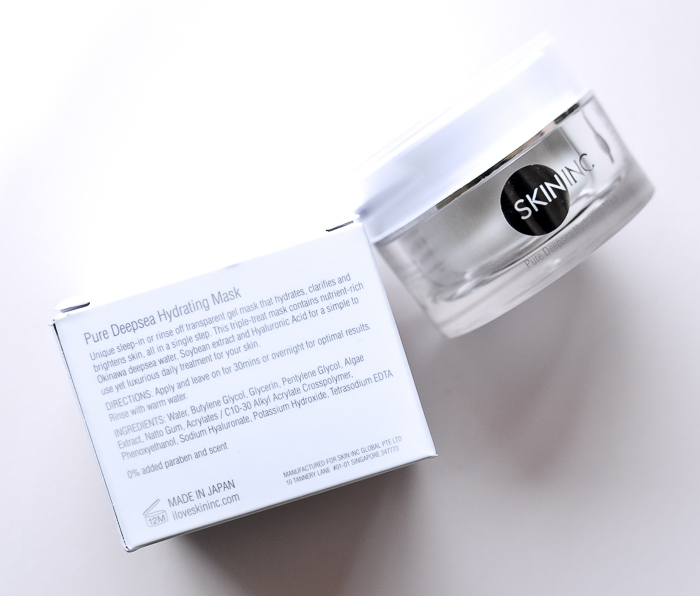 The mask claims to brighten, hydrate, and clarify skin with a mix of Okinawa deep sea water, soybean extract, and hyaluronic acid. What I would describe the results are as would be skin that looks healthy and refreshed, like you had a good night's sleep. While I love the effect, I have to admit the results aren't dramatic, and they last about a day. I find it best to use this mask every couple of days and rely on my regular skincare routine to maintain my skin's health. Acrylates/C10-30 Alkyl Acrylate Crosspolymer, Potassium Hydroxide, Phenoxyethanol, Tetrasodium EDTA. I have oily-combination skin, and for me, the Skin Inc Pure Deepsea Hydrating mask is a great way to give my skin a moisture boost without any heavy oils or pore-clogging ingredients. There are a lot of moisturizing masks available, but most seem to cater to skin types that need oils more than actual moisture. I do like using such masks during winter, but on days when my skin is normal-oily, I prefer lighter masks that simply hydrate my skin. I also like that I can use the same mask under my eyes too. While I love using this mask, I do feel that it works best for days when my skin is behaving normally. On occasions when I have gone lazy with my regular skincare routine, been out in the sun too much, and/or am just having random dry patches, I don't find this mask effective. Do give this a try if, like me, you have oily-combination skin and are looking for a simple hydrating moisture mask without any added heavy oils.